A Blog & A Half | A Yard & A Half Landscaping Cooperative, Inc.: Enriching Life with Beautiful Outdoor Spaces Since 1988; Worker-Owned as of 2014! Howdy! Check out our current blog posts on our new domain, http://yard.coop. Add ornaments, ribbons, and branches to planters for a personalized touch. Wreaths and garland aren’t just for the front door. Bring them inside for a natural look and fresh fragrance. Indoors and out, forgo bright overhead lights and floods in favor of subtle, intimate lighting, whether from real candles or warm LEDs. Christmas decorations don’t have to be over the top. Keep berries, evergreens, and colorful branches looking great by placing in moist potting soil and spraying evergreens with an anti-dessicant spray. If you don’t fancy sending a family member up on a ladder to hang lights, or having your hands sticky from wrapping pine garlands at the last minute, schedule a free estimate for holiday decorating. On Saturday, November 28, 2015, start your holiday season off right by scheduling installation of Christmas decorations by A Yard & A Half Landscaping Cooperative. We can prepare your home or business for holiday festivities with indoor and outdoor arrangements of evergreens, berries, and branches; roping, wreathes, and kissing balls; holiday landscape lighting; poinsettias; and even Christmas tree delivery. 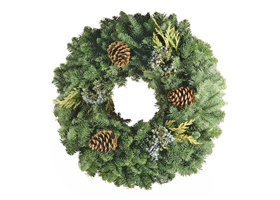 As a thank you for supporting small and locally-owned businesses, if you contact us on Small Business Saturday for your holiday decorating, we will include a free 20″ mixed evergreen wreath with your installation. 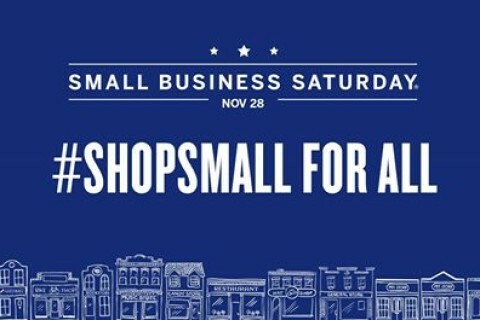 Why Support Us on Small Business Saturday and Every Day? A Yard & A Half Landscaping Cooperative is a 28-person, 100% worker-owned business. When you spend money with us, it stays in the Boston-area economy, as we pay workers from East Boston and Lynn, a floral shop in South Boston, a Sudbury nursery, a hardware store in Waltham. On average, coops source three times as many of their products locally than conventional corporations, and we’re no exception. Profits stay local, too, supporting our pro bono work with local charities, creating more jobs, and making better lives for our families and neighborhoods. And because we live and work here just like you, we make sure that we’re making the best business decisions to benefit the local community, from avoiding synthetic fertilizers and pesticides to recycling all of our plant pots and organic waste. If this sounds like an approach you want to support, contact us via our webform or call 781-788-8855. Opponents of Article 10 included landscape contractors, elderly residents, and residents who felt like the blower issue was a distraction from more significant issues facing the Town. Faith Michaels, a representative of the green-industry group BrooklineLeaves.org, offered to lead an effort to educate contractors, workers, and residents about reducing the impact of blower use. Several speakers asked the Town to lead by example, rather than exempting itself. Implement a registration system for all landscape contractors operating in Brookline. Improve public education about the existing restrictions on the use of leaf blowers and other lawn care equipment by residents and contractors. Edit Article 8.31 of the Bylaws to improve its readability, to clarify whom and what it applies to, and to include a reference to Article 8.15 of the Bylaws. Edit Article 8.15.6(f) of the Bylaws to include a reference to Article 8.31. Encourage the police department to maintain its policy of proactive enforcement of November 17, 2015 Special Town Meeting 10-12 Articles 8.15 and 8.31 of the Town’s Bylaws. Encourage the police department to feel empowered to issue citations for violations of Articles 8.15 and 8.31 of the Town’s Bylaws when it is appropriate. The objective of enforcement should be to control noise, and the department and its officers should feel comfortable using both warnings and citations to achieve this goal. Encourage the Department of Public Works to continue purchasing replacement equipment that complies with the decibel levels set out in Article 8.15. Encourage the Parks and Open Space Division of the Department of Public Works to develop a formal policy that identifies ways to minimize the use of leaf blowers, when it is practical. BrooklineLeaves.org has a wealth of scientific information on the noise, health, and economic impact of bower use, as well as steps that contractors and homeowners can take to make Brookline a more pleasant place to live and work. To learn more about the issues on both sides of the blower debate, see Reports of the Selectmen and Advisory Committee (pp 69-86). – We spent the extra money to invest in blowers that meet the 67 decibel regulations, including electric ones. – We pay living wages and benefits to our workers to create a stable, well-trained workforce. Our workers are not disposable; they want the company to be perceived as a good neighbor and community member. If the blower ban is passed, we will be out-competed by irresponsible companies who hire day laborers as a cheap, short term source of manual labor to do hand-raking. These workers will not get basic protections of employment law like minimum wages, overtime, or workers compensation in case of injury. This blower ban will primarily hurt the very workers who are making Brookline a nice place to live. Landscaping workers may work 60 hours a week for 6 weeks removing leaves. They will face an increase in repetitive strain injuries from use of rakes or handheld electric blowers. If they’re not covered as employees under workers comp, they will likely be sent packing if they’re injured. 3. “Just rake your own leaves, already! Or pay someone else to do it.” The exemption for Town crews will save Brookline taxpayers some money, but the ban will raise costs for those homeowners who can least afford it: senior citizens & those with disabilities might not be able to do their own hand-raking, and will be hard hit by increases in costs to have someone else do their leaf removal. Alternately, they may not clean up leaves. 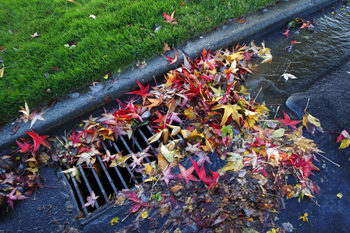 That’s great for the soil, but neighbors might not like the messy look, and leaves in storm drains will increase street flooding problems. 4. “But blowers are so noisy…” At 80-100 decibels, walk-behind lawn mowers are actually louder than the 67 decibel blowers required under Brookline’s existing regulations. And that’s not to mention chainsaws, wood chippers, or excavators. Blowers have been targeted because often several are running at a time. Rather than an outright ban, Brookline might consider regulations similar to Cambridge and Arlington, which limit the number of blowers that can be used at any one time, based on the size of the property. 5. “What about the effect of blowers on allergies, asthma, and blood pressure?” We aren’t epidemiologists, but Alan Balsam, Brookline’s health director, has said that the Advisory Council on Public Health “found no compelling health threat” from the use of blowers in accordance with Brookline’s current regulations. Even the American Lung Association has recently acknowledged that the primary concern for pollution from 2-stroke engines comes from machines manufactured before 2012 EPA guidelines went into effect. Thanks to everyone who attended our Gardening in Small Spaces workshop at this weekend’s NOFA Summer Conference! As promised, here’s the powerpoint presentation and handout. 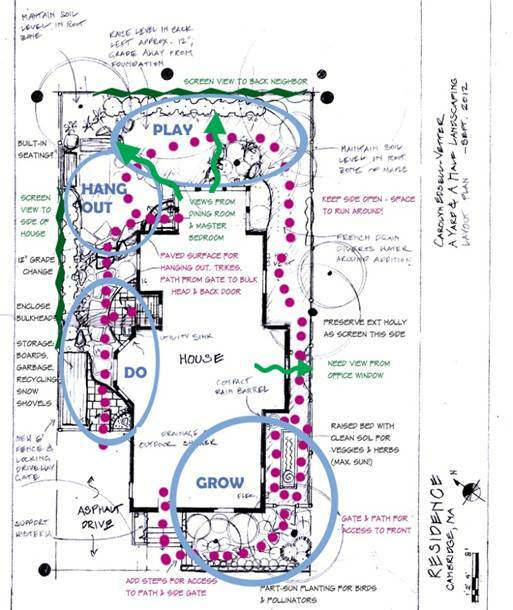 If you missed the workshop, we looked at four case studies of urban gardens designed and installed by A Yard & A Half Landscaping Cooperative, bringing permaculture lessons to bear on planning and designing small spaces. We also explored some sustainable technologies for rainwater harvesting and urban agriculture, edible plant lists for containers, and resources for site assessment and planning. The Winter Conference will be January 16, 2016 at Worcester State University.